Once you get your head around Epoch, its unique combination of compression and tonal shaping will have you hooked. Impressive transient control. Very tight gating. Creative comb filtering Affordable. Innovative. Initially confusing concept. Some parameters very sensitive. "The processed signal passes through a phase rotator, then a fractional delay before being modified dynamically and blended back in with the dry signal"
The source signal is paralleled, with one half processed and the other dry. The processed signal passes through a phase rotator, then a fractional delay (+/-408 microseconds) before being modified dynamically and blended back in with the dry signal. Introducing that tiny delay creates a comb filtering effect, but a dynamically controlled one. The dynamic sidechain uses two amplitude detectors (feedforward and feedback), plus a look-ahead transient detector, and the balance of detection can be influenced by the Tight (transients) and Classic (feedback) controls on the left. Of the other controls, some are obvious (Attack, Release and Output), while others, such as Sensitivity (threshold) and Strength (ratio), are less so. By default, Epoch uses a program dependent release (PDR) setting, but this can be switched to optical-style, too. You can also invert the envelope behaviour, enabling gating effects when using the 180-degree rotation setting. Epoch actually processes the input as a mid/ side signal, so you get an M/S balance control at the output, and Mid (green) and Sides (orange) meter needles. Finally, Epoch also includes two oversampling settings (Regular and Clear), as well as a Juice control, which affects the accuracy of various internal settings such as FFT resolution and parameter precision. "It should come as no surprise that Epoch is capable of some pretty interesting effects"
It should come as no surprise that Epoch is capable of some pretty interesting effects. However, it's best to start at the default phase rotation (180 degrees) and delay (zero). This creates an amazingly effective transient squasher that, at high Strength settings, can virtually remove prominent transients such as snare and kick drums (at 180 degrees, the phase inverted signal is combined with the original). At lower settings, Epoch offers very transparent transient control. By inverting the dynamics envelope, the same setup delivers a very tight gate, with the Attack, Release, Tight and Classic detection controls providing plenty of shaping flexibility. Shifting the phase rotator even a few degrees above or below 180 can significantly change the outcome, causing the dynamic response to become less obvious. Adding some delay at this point dials in comb filtering, revealing another layer to Epoch's transient spectrum-shaping ability - once again, tiny shifts can make a big difference. Changes to Epoch's phase rotator sound very smooth, and you can get some great effects by manually sweeping that particular knob. Another thing to note is that higher Juice settings can hit your CPU hard. 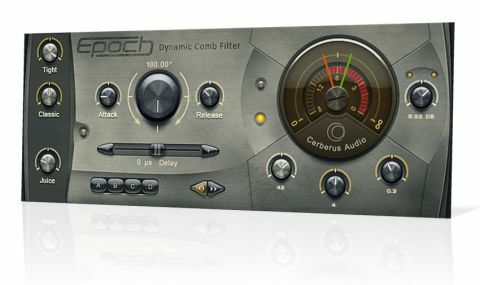 We found Epoch a fascinating plugin, offering a range of fresh and creative dynamic effects. But 'getting it' conceptually is absolutely vital to making the most of it, and in use, you often get the sense that you're only scratching the surface. Even so, we always like to champion innovation when it deserves championing, particularly at this sort of price point.